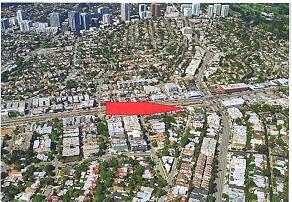 One of the best and most prime development sites available for sale in Southern California is located at the South-West corner of San Vicente Boulevard @ 4th : 326 San Vicente. With approximately 25,000 Square Feet of land, this unique site is suitable for development of 17 ultra-luxurious condominiums or 5 to 10 mini estates. Located within 1 block to Ocean Avenue, this site offers an incredible 325 feet of frontage (13+ feet/1,000 SF of land) along two beautifuly parkway streets containing a landscaped center median. This feature will greatly enhance the project design by providing much desired brighter units with parkway views. Existing Improvements consists of 17 large 2 bedroom 2 bath rent controled apartments, with Current Gross Income of $291,000, rented at about 35% of their fair market value of $714,000. Structures are in fair but operating condition. Entire city block, 25,909 Gr SF of land area (.6 Ac), Zoned LA-C2-1-O (1.5 F.A.R. ), Santa Monica from Beverly Glen to Pandora. 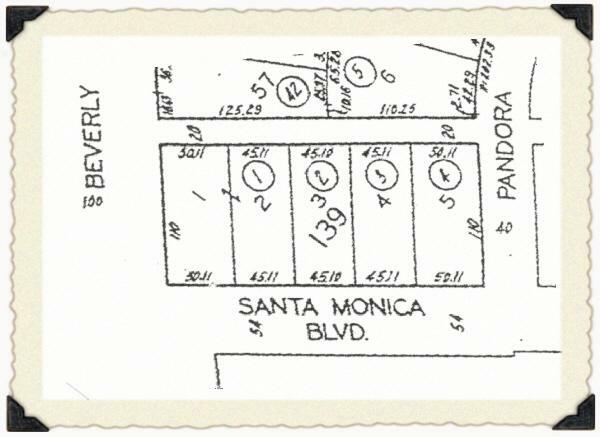 5 lots with huge frontage of 235 feet along Santa Monica Boulevard and 110 along Beverly Glen to a 20 ft alley. Residnetial and/or commercial uses. Includes leased ownership of billboard structure/permits with provisions of cancellation. Information contained herein is not guaranteed or warrantied. Hard to find beautiful 2 story executive garden offices in Beverly Hills with ~ 5,500 Sq. Ft., excellent parking, private patio, skylights and many other features suitable for an owner user. Located next to Century City, many service businesses, restaurants, etc. Build your own home or for resale, in the woodsy area of Hollywood Hills, close to the village, walk to Griffith Park, reach out and touch the "HOLLYWOOD" Sign. Full set of plans for 3,800 SF Home, available survey, topo map, soils test, all utilties in, its ready !!! !